Aayla Secura’s Eta-2 Actis-class light interceptor sees plenty of action during the Clone Wars. As a Jedi Knight she commands troops during the conflict as a Republic General and flies her fighter on many intelligence-gathering missions and covert operations. One such mission takes her to Trigalis, where she assists Obi-Wan Kenobi in his hunt for Asajj Ventress. Today I will be reviewing Aayla Secura's starfighter from Hasbro's Star Wars 30th anniversary collection (Target Exclusive). Aayla's starfighter comes in the nicely illustrated 30th anniversary box as shown below. I actually really like this packaging. The reason I like this box is because of the designers choice to use a dynamic action illustration of the craft coupled with the pilots face in the right corner. In my opinion this combination seems to complement one another. The ship right out of the box requires no assembly and is made from nice quality plastic. Aayla's starfighter differs from others in this line because it has absolutely no stickers to apply and has no weathering. Unlike Anakin Skywalker's that had all details already applied by the manufacturer. This is still a great relief considering that Obi Wan's Starfighter had a ton of small hard to apply stickers and weathering. Where is the consistency Hasbro? I really like the design of this Starfighter, it's impressive, featuring aesthetically pleasing lines that really share the look with the episode IV-VI ships. The next 6 photos show you a quick walk around of the ship. Some of the highlights I would like to point out are the retractable landing gear, removable R2 unit, firing missiles with release button located on the rear portion of wing. Also, note how the front of the cockpit bears a very strong resemblance to a TIE fighter. The next 2 photos show the Starfighter with the wings open. The wings are spring loaded are are actuated with a lever located at the rear underside of the cockpit. With the wings open you can really see this ships obvious relation to the TIE fighter. The next 2 photos give you a close up the R2 unit. You can remove the R2 unit, leaving a void. I thought that maybe the void would accept a full size astromech figure. Unfortunately it doesn't. Its still a nice touch to add to the ship. The last photo shows you the canopy open, allowing view of the nicely appointed cockpit of this small starfighter. All the details are painted with no stickers to apply. After all the above being said I must say that I like this ship. I think its a very cool design that lends to the history of the TIE fighters lineage. The only thing that I feel is bad about this ship is that Hasbro has made a repaint for almost every Knight in the Jedi order. The "bad" part about this is that each ship has virtually no difference from another. 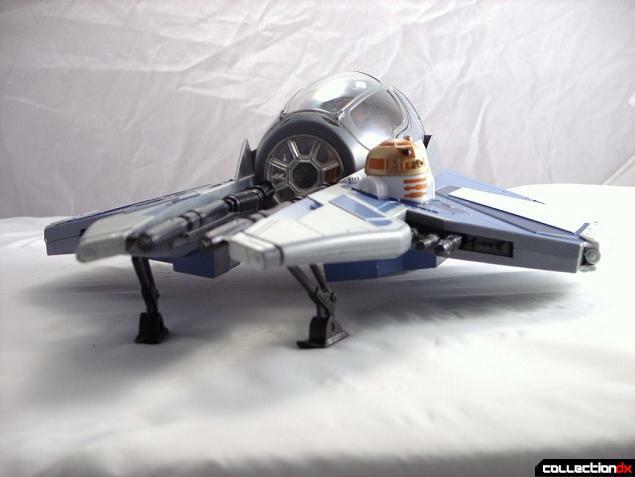 You can see this in the review of Obi Wan's and Anakin Skywalker's Jedi Starfighters. My advice is just buy one. To make your choice easier, pick one that is piloted by your favorite character or is your favorite color scheme, unless your a completest or have tons of disposable income.